Supporting the creation of new work is the heart of the Pittsburgh New Works Festival. To that end, PNWF has re-invented its staged readings to make them more valuable to playwrights. We’ve built a creative laboratory that gives the producing companies the flexibility to explore the scripts in everything from seated reading to full productions. Pay what you like to join us for an evening with drinks, food and new theatre! produced by Hambones Theater Co.
It’s February, 2007, and NASA Astronaut, Lisa Nowak, is somewhere between Houston and Orlando, driving in adult diapers to kidnap and murder her ex-boyfriend’s new lover. Along the way, she revisits the moments that brought her to this infamous drive, forcing her to confront the real reasons for the shocking turn of events that made her a news sensation. Shelby Solla is a playwright and performer based in Brooklyn, NY. She is a Pittsburgh native (raised in Freeport.) Shelby is a May 2018 graduate of Marymount Manhattan College with a B.A. in Writing for the Stage. 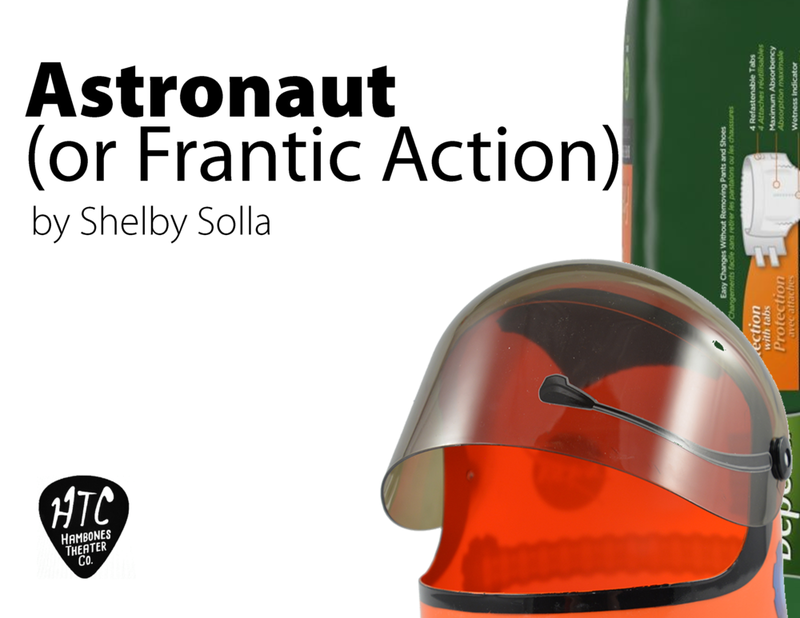 Her play, “Astronaut (or Frantic Action),” has previously been produced as a reading by NYC’s Dixon Place Lounge. In addition to her work as a playwright, Shelby is an improviser and sketch comedy performer, and has performed at the Upright Citizens Brigade’s annual Del Close Marathon. Greg wakes up to find himself in a small room with three strangers – and no way out. Greg struggles to understand the meaning behind his confinement and discovers he may be an unwilling participant in a strange political experiment – with possible extra-terrestrial overtones. As contrasting theories abound, the roommates become increasingly hostile and soon find themselves involved in a dangerous stand-off, with the future of their world – and the nationhood of Zanzibar – at stake. Ted Stenson is a Calgary-based writer and filmmaker. He is a graduate of the MFA Playwriting program at the University of Calgary. His plays have been performed across Canada. Recently his play A Chance on Love was a finalist in the NewMarket National Playwriting Contest. Jim Moss’ plays have been produced at the Straz Performing Arts Center, Stage Works, and Carrollwood Players in Tampa FL, and also in theatres in Miami, Orlando, Chicago, Los Angeles, and Off-Broadway in New York, including: La MaMa La Galleria, the American Globe Theatre, and the Manhattan Repertory Theatre. In 2016, his play, “The Last Shirt Off His Back,” won the Audience Choice Award in “The Seven,” a national playwriting competition at the Cell Theatre in Albuquerque, New Mexico.